Former Real Madrid manager Zinedine Zidane has contacted Manchester United’s French stars Paul Pogba and Anthony Martial about replacing Jose Mourinho. CaughtOffside understands the 46-year-old is growing increasingly confident he could be offered the United job imminently after the club’s poor start to the season and due to strained relations between Mourinho and executive vice-chairman Ed Woodward. The Mail are among the sources to recently link Zidane with the Red Devils manager’s position, and it’s now emerged he’s told Pogba and Martial about the possibility of a move. In an exciting development for United fans, CaughtOffside have been told by sources close to Zidane that he spoke with the unsettled duo about staying put in Manchester despite their current difficulties and various links with moves away throughout the summer. Both have performed poorly under the harsh and demanding Mourinho, with Martial rarely offered a regular starting spot in the team, while Pogba feels he has been played out of position. Zidane, however, has assured them that he could be on his way soon, which both players are understood to have reacted extremely positively to. This is somewhat in line with a report from the Telegraph stating both Martial and Pogba seem ready to wait it out at United as Mourinho’s future looks in doubt. United sources recently denied plans to replace Mourinho with Zidane, but journalist Daniel Harris recently revealed they approached him as early as a month ago. Don’t usually do current affairs, but: “understand” United met Zidane in LA, pre-season. Thanks bye. 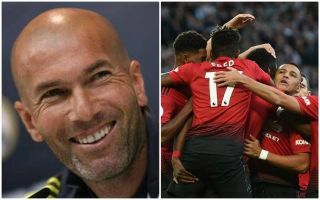 It certainly looks like this change to the Old Trafford hot seat could come imminently, and that’s very good news in terms of keeping Pogba and Martial as Zidane would likely be in a better position to get his fellow countrymen firing in the Premier League. The former Madrid boss was a big success in less than three full seasons at the Bernabeu, winning three Champions League titles and La Liga before stepping down in the summer. Mourinho, meanwhile, looks past his best and has never quite looked the right fit as United manager due to his conservative playing style and notorious lack of trust in young players or those who like to play with flair and freedom. A talented attacking midfielder himself in his playing days, Zidane’s management style seems to have the perfect blend of big-game mentality to get the job done by whatever means possible, whilst allowing forwards a certain degree of self-expression when attacking. United take on Tottenham in their next Premier League game and a bad result is sure to pile the pressure on Mourinho and spark more talk of an exit, with the Mirror describing the atmosphere at the club as ‘toxic’ and ‘worse than ever’ as it is.